We print posters in various sizes from A3, to larger than A0. The size chart on the right is designed to help you get an idea of the size compared to standard A4 paper. The sizes we produce are listed below. If you want luxurious posters to advertise at a distance, or to sell at your gigs, this is what to get. Larger posters require the thicker paper, and the quality is awesome. PVC Matte White is weatherproof, so perfect for outdoor use, where a paper poster will degrade. available in 220mic and 400mic thickness. Our poster prints are great; fantastic quality, amazing prices! The best bit is due to the fact they printed digitally; you don’t have to buy a massive amount in one go. Need one poster? That’s fine; we can do that. Want to design your very own poster to adorn your wall? Or advertise your school fete or nursery open day? 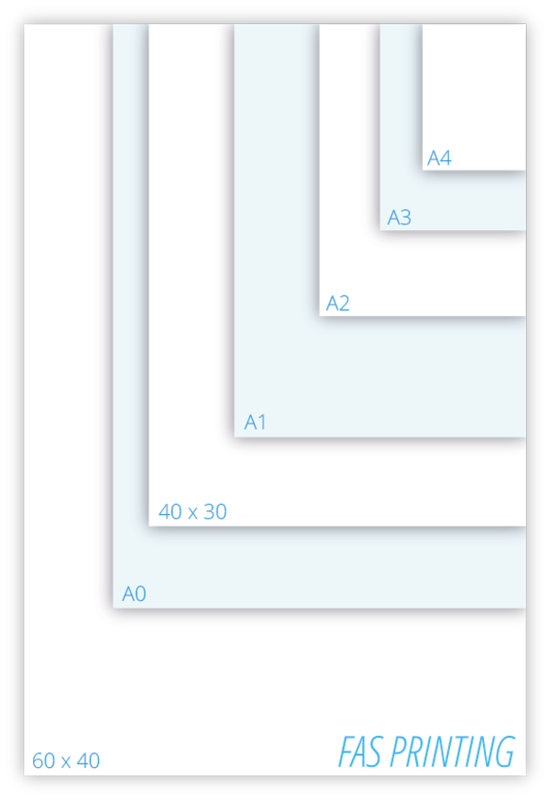 If you only want between 1 – 250 posters then digital is the way to go. We print on 250gsm silk, 220mic or 400mic PVC matt and can even print on 300mic polypropylene for use in backlit lightbox displays. We print A0, A1, A2, A3, 40x30 and 60x40 so we can cater to most needs. Wikipedia says: A poster is any piece of printed paper designed to be attached to a wall or vertical surface. Typically posters include both textual and graphic elements, although a poster may be either wholly graphical or wholly text. Posters are designed to be both eye-catching and informative. So why not get in touch to find out how we can help you. We think you will be surprised at how little it costs to get some fantastic posters designed and printed. No matter what you need them for – we have a solution for your needs, so get in touch for a quote. A0 poster prints are a fantastic way of getting noticed. Live music nights or even your very own poster designs on your bedroom wall; we can produce A0 poster print in as few copies as 1 – of course, the price goes down with more, but we can still print and deliver one A0 print at a great price, thanks to our digital printing technology. High quality, low-cost printing in London, UK.